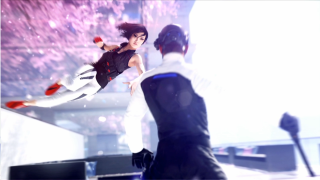 Here's the first proper Mirror's Edge: Catalyst footage from Gamescom 2015. It shows Faith freerunning through the open world before infiltrating a gorgeous and remarkably impractical skyscraper. The City's architects have a great eye for colour, and know exactly where to put a light rig to highlight platforming opportunities for runners. Faith also flings herself around a pole to kick a guy into some glass, which is the first we've seen of the momentum-based combat system that uses Faith's speed to KO opponents instantly. Find out more about that, and the new open world setting, in our hands-on preview.